The Apollo Hospitals Enterprise Ltd shares have gained 20% from its June quarter (Q1) results announcement last week. Profitability improved during the quarter, while losses at new hospitals tapered, stoking optimism that the company is on the threshold of a revival in earnings. For perspective, the stock lost 16.8% over the last three years underperforming the broader markets as prolonged capital expenditure (capex) impacted profitability and return ratios. According to Nomura Research, the valuation gap between Apollo Hospitals and other regional peers has expanded, with the former trading at a discount. Perhaps taking note of the underperformance, the focus has now shifted to asset optimization. “The key takeaway from the management commentary was a clear cut hint of near completion of the long capex cycle and an asserted focus on improvement in margins and return ratios," ICICI Securities Ltd said in a note. The Navi Mumbai hospital reached break-even in June, the management told analysts. That means now it’s only the Nashik hospital that is making losses in the new hospitals segment. 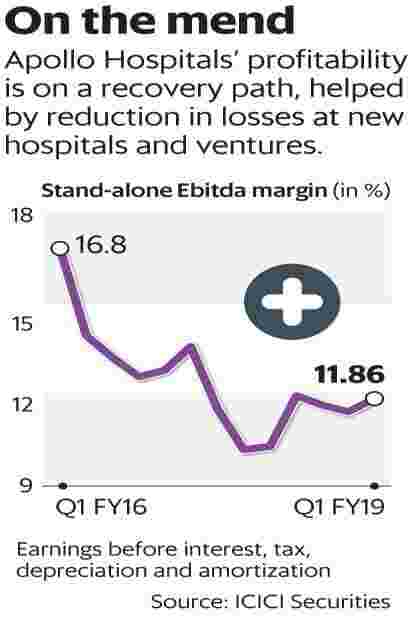 Operating losses reduced at the retail healthcare unit Apollo Health and Lifestyle Ltd and the management expects the business to break even by H1 FY20. As these two segments begin contributing to earnings, analysts see a notable improvement in Apollo Hospitals’ return ratios. “Two of Apollo Hospitals businesses are yet to contribute to RoCE: 1) New hospitals, with ₹ 12 billion capital employed, are running at just ~40% occupancy; and 2) Apollo Health & Lifestyle, with ₹ 6 billion capital employed, is running at ~30% utilisation," Edelweiss Securities Ltd said in a note. As the Navi Mumbai hospital turns profitable and Apollo Health and Lifestyle achieves break-even, the broking firm expects the return on capital employed (RoCE) to rise from 8% to around 15% by FY21. The returns expansion, if it pans out as projected, will help strengthen investors’ confidence. But with competition on the rise and the healthcare business increasingly coming under regulatory scrutiny, investors would do well to keep profitability expectations in check. As ICICI Securities points out, profitability at existing hospitals is being compressed due to regulation on stents, implants prices and the negative impact of the goods and services tax. Also, it has to be seen how fast the company will move if a particular venture continues to make losses beyond the projected break-even time, especially given the high involvement of promoters in the company. These two factors—regulations and loss reduction at new ventures—will determine the pace of earnings accretion.